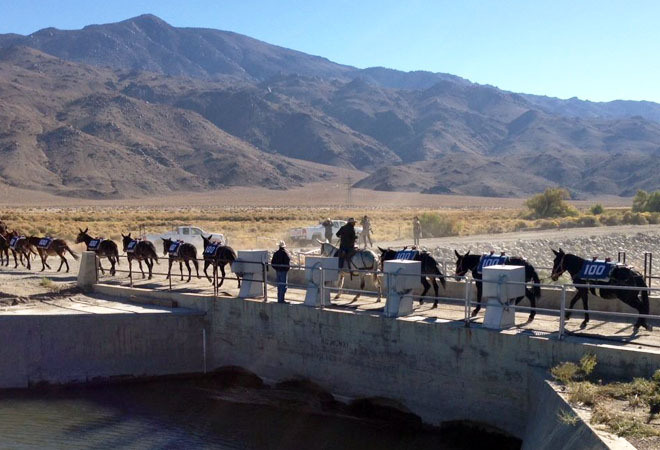 Laura Bon follows the migration pattern of 100 Mules for her Artbound documentary about the Los Angeles Aqueduct. KCET really knows how to work a theme. In the sprit of the L.A. Aqueduct’s 100th birthday on November 5th, the station has created a multi-media experience surrounding the structure, including weekly online articles, photographs, and documentaries. In honor of the celebration, KCET’s Emmy-nominated program Artbound, which is now in its third season, is running a special three-part documentary by artist Lauren Bon. In AgH2o, the premier installment that aired October 10th, Bon mined the Owens Valley for photography materials—silver in the mines, gelatin from cows, abandoned silohs, acidity in the lake water—to make film used to shoot photos of the Valley, creating a meta product that showcases the natural resources available around the aqueduct. Work on the second segment began on October 18th and follows 100 mules as they migrate for twenty-seven days along 240 miles through Owens Valley. “100 Mules,” the resulting documentary, is due to air this winter. The third piece of the trilogy involves literally breaking the walls of the L.A. River. Bon will be building a 20th century wooden water wheel in order to recreate an irrigation system that could potentially bring water Downtown. KCET’s materials surrounding the aqueduct can also be found online, where readers can voice their opinions on weekly articles about the structure by voting for the ones they like best. Posts with the highest votes will be made into Artbound’s next documentary. We’d like to join KCET in saying, happy birthday, Aqueduct! Here’s to the next chapter.